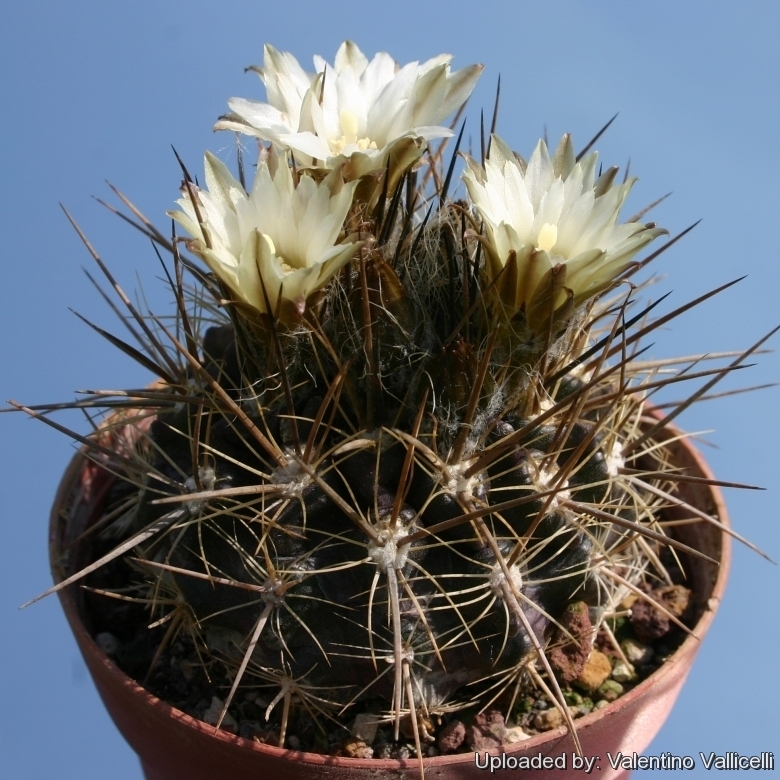 (a white flowering specimen) It is a fiercely spined Eriosyce from coastal Chile (The Atacama desert). Habitat: Coastal areas, with coastal fog (camanchaca). The plants obtain water mainly from condensation. 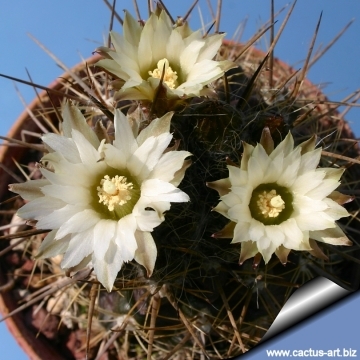 Description: Eriosyce taltalensis subsp. 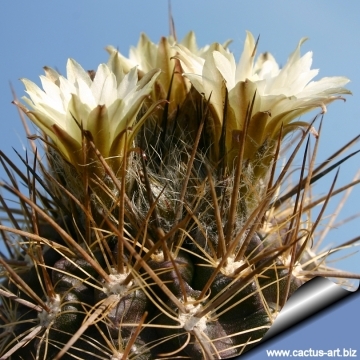 echinusis a solitary, fiercely spined cactus with variable spine size and white wool on top. 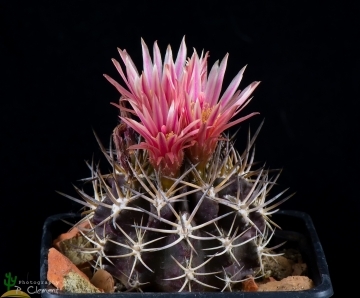 It distinguishes from the standard Eriosyce taltalensis for the stouter fierce spination and flowers that are usually white below, fuchsia red above, and comprises two varieties. var. echinus that has stem tips with short wool and var. floccosa that has stem tips with long tufts of wool. Stem: Globose, 8 to 15 or more cm in diameter and tall ( in cultivation it is subglobose to elongate and may slowly reach an height of 20 or more cm). Dark green, tan to grey-purple tinged stem and conspicuously woolly at apex. Fibrous, arising from a short, conical tap-root. Ribs: Up to 13, notched, forming tubercles with sunken areoles. Spines: Juvenile specimens have only few spines, but the numbers increase as they get older, and areoles can have over 20 spines on mature specimens. They are straight or curved, dark brown to black, soon becoming chalky-white or greyish. Radial spines: 6 to 12, 3 to 20 mm long. Central spines: 6 to 12, 20 to 40 mm long. Flowers: From apical areoles, narrow campanulate or funnel-shaped, about 3 cm in diameter. The colour comprises red, fuchsia, pink, creamy white and yellowish. Floral tube with abundant white wool and twisted bristles. There might be over 50 flowers on a mature specimen (only mature specimens bloom). Fruits: Reddish, elongate, opening by a basal pore. 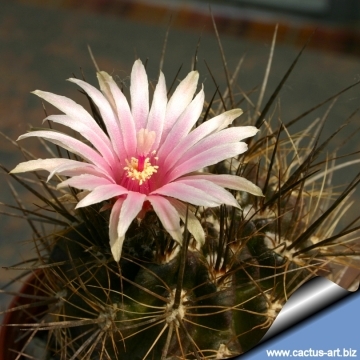 Cultivation and Propagation: It is a summer-growing species of relatively easy cultivation. 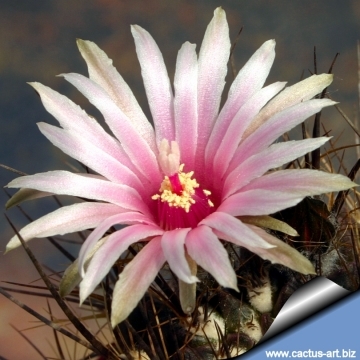 It has a thick taproot and is susceptible to over-watering if kept in a non ventilated place. , sometimes it is grafted to avoid root rot problems. 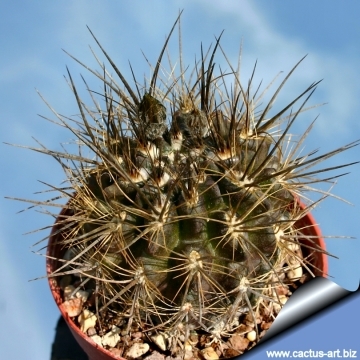 Likes warmth (recommended minimum winter temperature 5° C) But plant kept perfectly dry can easily survive to winter night temperatures below 0° C. Sun Exposure: Suited for sunny-brightly exposure; can tolerate light shade. Cultural Practices: Suited for airy exposures. Needs deep pot and gritty mineral substrate with a very good drainage to accommodate its tap root. Water regularly in summer, keep dry in winter. Propagation: Usually propagated from Seeds. (seldom produces offsets) or graft. Seeds can be sown in the spring or summer. The seedlings should not be disturbed until they are well rooted after which they can be planted separately in small pots.